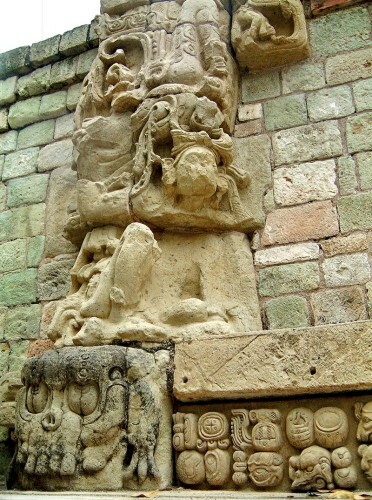 W1096: Bakab resting on the Cauac Monster heads resting on the two Bakabs’ shoulders pointing away from the door. The serpent’s body weaves across the doorway to resemble clouds with strange human-like creatures gripped within its spiralling body. The backs of the Bakab appear to turn into a strange crocodiles or toads that nose-dive into the underworld. 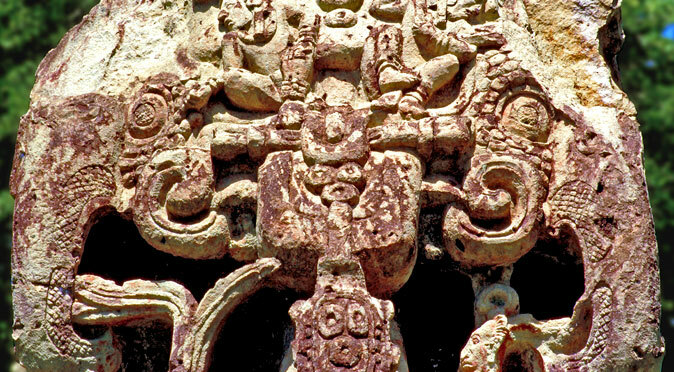 The carvings, the Temple, and its alignment, hold multiple meanings. 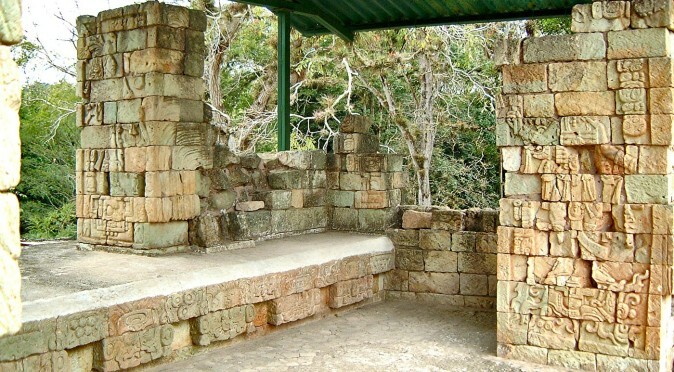 The Temple is sat on a raised platform which represents the sacred mountain. Within this mountain are a number of sacred caves, with the Temple acting as the entrance and the vaults deep within acting as the Underworld – or Place of Fear – where the Ancestors lived. Temple 22 was a little bit peculiar in that it had a cave within a cave and this carved doorway was inside the another entrance, which was carved in the form of a gigantic mouth. 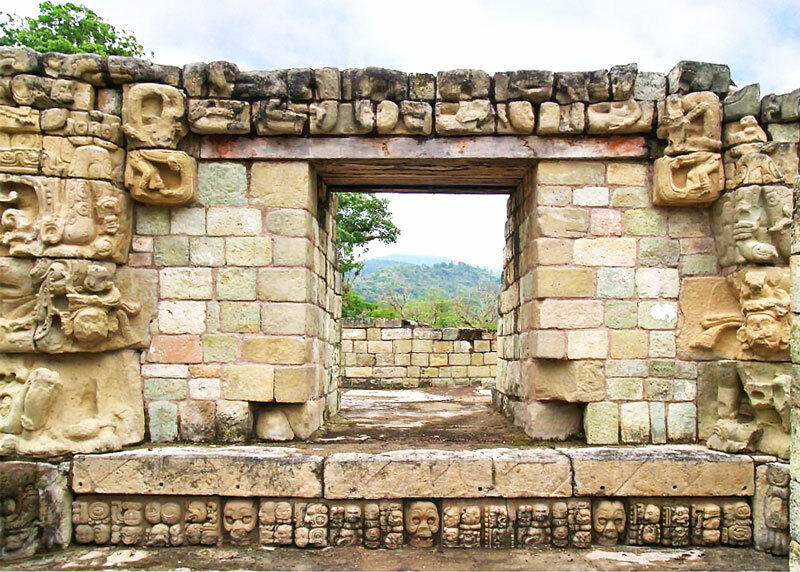 The south facing doorway means that the inner carved door with its Sky-Arch recreates the path of the sun from East to West, with the Bakab on the right being Hobnil, the Eastern Bakab, and the Bakab on the left being Saccimi, the Western Bakab. The Sky-Arch isn’t simply representative of the sky as seen by day, but also the sky at night. Therefore, we can liken the double-headed serpent to the Milky Way, and the strange characters that appear entwined in the Serpent’s body as stars or constellations. W1097: Glyphs on the step Beneath the doorway is a carved step which features glyphs and symbolic skulls, presumably representing the words of the ancestors who dwelt within the underworld. 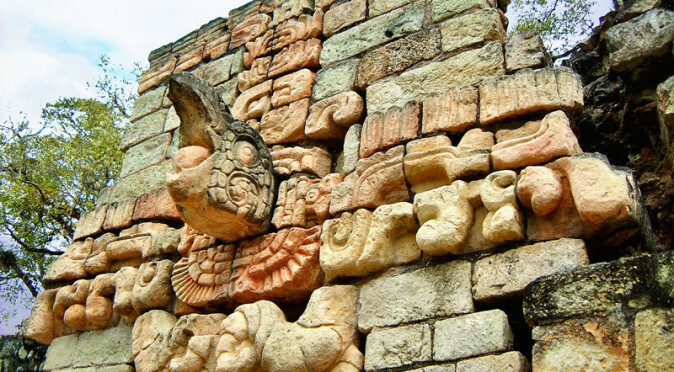 They may also provide more significant meanings to the Temple and its carved entrance. 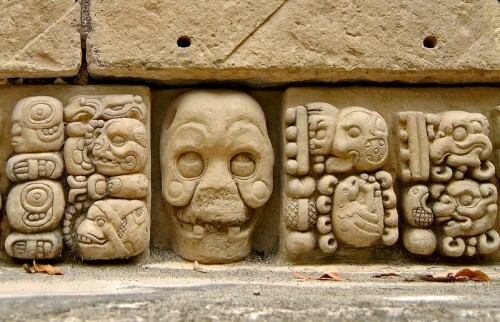 The glyphs to the right of the skull furthest to the right appear to be a date sequence for the date 9.14.0.0.0, or the 29th November, 711AD (fig W1097). 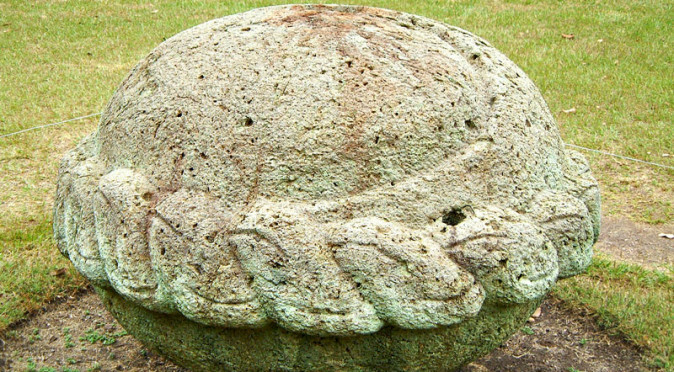 This date fits within the time frame that the temple was built, but was also a significant astrological event, with Venus rising as the evening star, the sun positioned at a crossroads in front of the Milky Way in the west and the Moon positioned at the crossroads with Milky Way in the east1. 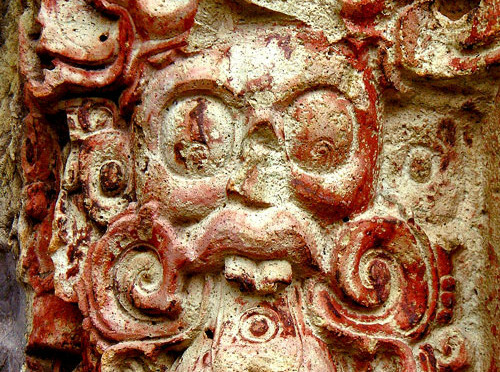 Exactly what these portents would have meant to the Maya is unknown, but these type of events are exactly what the Mayan Calender was built around and they were celebrated with festivals, rituals and sacrifice. This event on 29th November, 711AD, is also recorded on the magnificent Stela C, which confirms two key events, the rising of Venus as the evening star, and the passing of Orion (the Cosmic Turtle) directly overhead. W1082: View Across East Court to Temple 22In summary, Templo 22 is a portrait of the cosmos as the Mayan’s saw it, with the temple acting as a sacred cave, the underworld buried beneath it and the celestial heavens rising up around it. 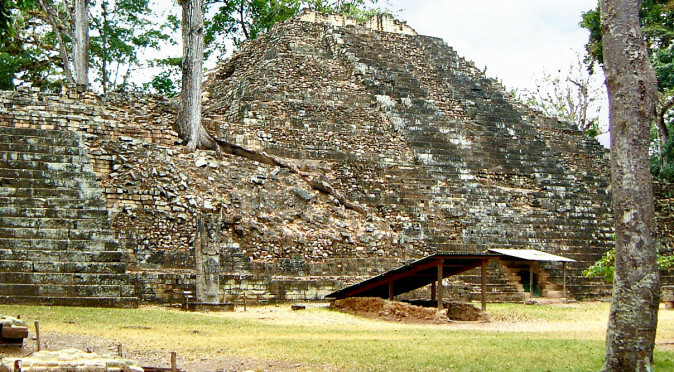 Like so many temples, Temple 22 was built to be a dwelling place of the Gods and a place where the God-King of Copan could physically mingle with his ancestors and the other Gods. But the Sky-Arch, and presumably other features that are now lost, made Temple 22 an observatory too. 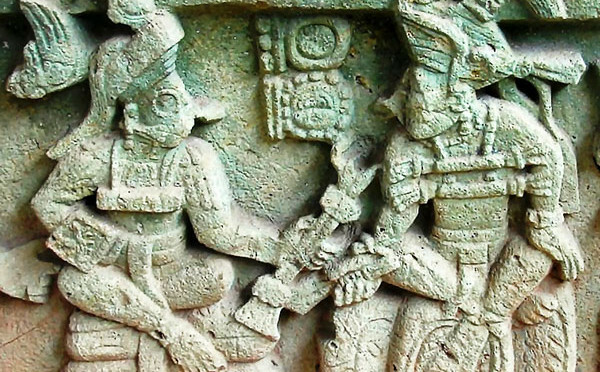 Cosmological events could be tracked using it, portents could be read through it, ancestors and Gods could be contacted within it – it was a portal to supernatural power and divine information. 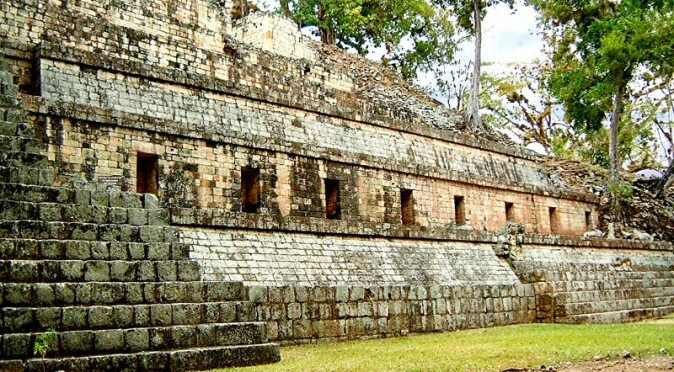 The temple was never altered, so it seems the temple was also used by 18-Rabbit’s successors to harness otherwordly powers, communicate with ancestors and pray to the Gods, until Copan was abandoned. Incredibly, the glorious entrance and other carvings that still adorn the temple make up less than 1% of the carved stones that were once part of this magnificent building. So far, over 4000 carved stones have been recovered that were found dispersed around the temple following Temple 22’s collapse into its own vaults. W1099: Chac on Templo 22This catalogue includes 20 incredibly ornate life-size figurines of the Maize God – which possibly correspond to the twenty cycles (years) that 18 Rabbit had presided over when Temple 22 was built. 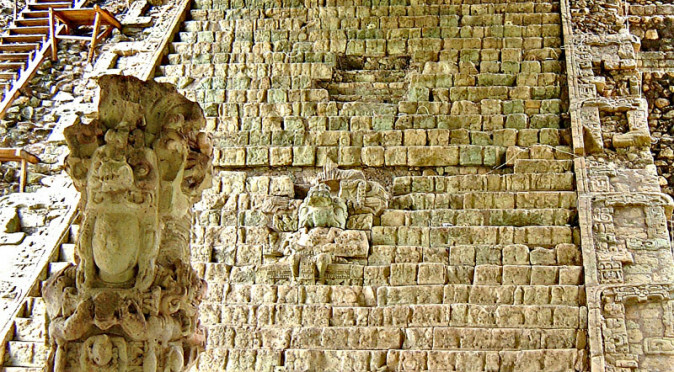 Temple 10L-22 also had a second story and a stone-carving workshop before it collapsed – add this and the 4,000 additional carvings to the structure that remains, and Temple 22 would clearly have been one of the grandest temples ever constructed in a Mayan City during the Classic Period2. 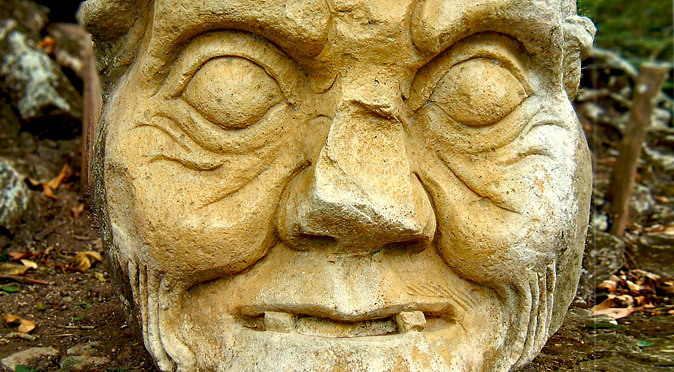 Unfortunately, attempting to reconstruct the original building is impossible, as many of the carved pieces have been dispersed around the museums of the world and sold to private collections. Of the pieces that remain, the majority are fragments that have been cleared from the temple area and stacked into almost insurmountable piles. Others are so large that they require as many as four men to move them and remounting them would require a huge number of people and runs a high-risk of irreparable damage. 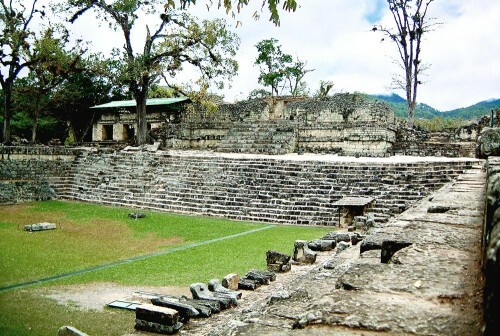 However, considerable effort is being put into reconstruction, with many pieces being put back together within the Copan Sculpture Museum located at the archaeological site, and even more work taking place using 3D Modelling techniques2. 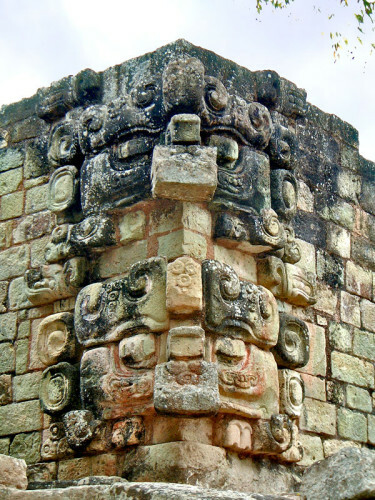 A report of this work can be found here: The Temple 22 Façade Reconstruction Project.